coming to Tulsa for one night only all the way from St. Louis, MO. Add uniqueness to your HoopDance! Shelly McBurnett is a Hoopnotica certified Hoopdance instructor from South Texas. She began hooping in March 2008 and in 2010 founded the San Antonio hoop club, known as The Hot Hoopers. 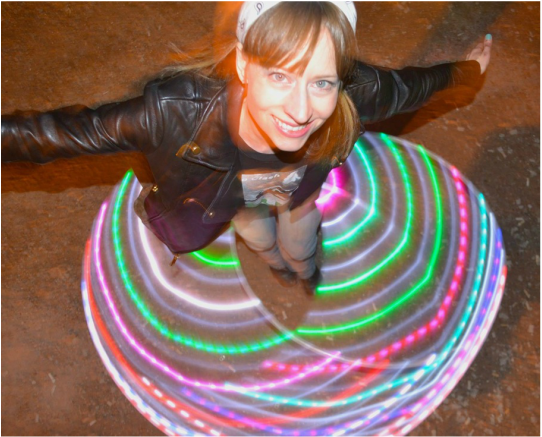 For the next 3 years she taught twice a week, hosted monthly jams, and performed at many events sharing her love of hooping with her city. The Hot Hoopers grew to over 350 members. Shelly moved to St Louis in July 2013. "Through Hoopdance I have found the perfect balance of creative expression and physical challenge. When I am in the hoop I feel absolute freedom, I am an artist through movement. Hooping has brought such joy to my life, I want to share it with everyone." Shelly has a background in Shaolin Kung Fu and feels that martial arts have greatly influenced her hooping. Both to cultivate discipline and body awareness, bringing together mental, physical and spiritual components that improve overall quality of life. Her passion is promoting health, creativity and well being through fun activities. The amazing Shelly engrossed in her hoop zone!